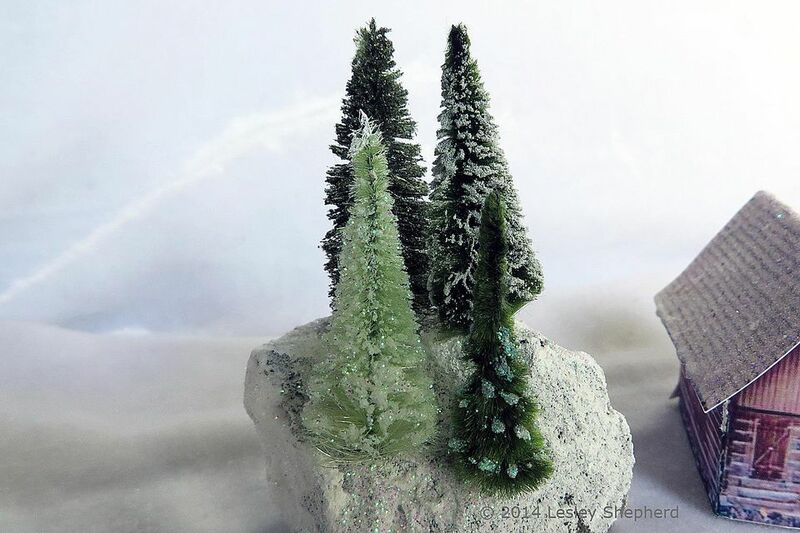 Glitter trees for a printable micro or N scale winter village are easy to make from chenille bumps, glue and fine glitter. The trees shown here (instructions on the pages which follow) are made from vintage light green and dark green rayon chenille bumps, which tend to be fuller than the modern version. The color of the trees can easily be adjusted with the type and size of glitter you use. The two bumps on the left hand side (facing you) of this set are both a pale green base, while the two on the right hand side are a deep green. "Peridot" micro glitter (I used glitter from Glitter Ritz) gives the lighter green bump similar coloring to the darker green bumps. When using glitter for these trees, choose micro fine opaque glitters for even coatings. I used opaque white for the dark green bump at the front for a snow effect, as well as using it for the snow on the base, the light green bump coated with opaque peridot looks like a much darker tree, and the glitter effect is very light. For bolder glitter effects I used an "Ultra Fine" transparent glitter also from Glitter Ritz. This has larger transparent particles, and picks up more light. Check for the highlight color on glitters, the one I used for this scene has green highlights, which work well for forest scenes. For decorated trees you may prefer red or gold highlights. The micro scale trees in this tutorial are made from sections of vintage rayon chenille bumps like the ones in the photo on this page. You can use these bumps to make a range of sizes of trees suitable for micro scale or "N" scale scenes. I prefer the vintage chenille to the modern product, but either will work for trees. You can also make your own basic trees from sisal or jute and twisted wire using the instructions on the Little Pink Houses Blog. Smaller sized bottle brush trees for Christmas villages or railroads will work as well. Bent Nose Tweezers or Haemostats - to hold the trees while working with the glue and glitter. Trimming Chenille Bumps To Tree Shapes. The first step in making glittered winter trees from chenille bumps is to determine the 'nap' of the chenille. Some bumps have an obvious fiber direction. Your fingers should run smoothly down the bump from the top to the base for the best tree shapes. If the fibers resist your fingers, the direction of the fibers may run opposite to the way you are stroking them. For trees, you want to be able to stroke the fibers easily from the top of the tree to the base. Once you know the direction of your fibers, use end cutters or some other wire cutter to trim the chenille bump to the shape you want for the top of your tree. I cut mine to resemble traditional evergreens for my realistic printable village. Some fantasy style glitter villages use whole bumps to resemble Italian cypress trees to stand next to individual houses. Once you have the top of your chenille bump trimmed for a tree, determine how 'tall' you want your tree to be and cut across your bump at least 1/4 inch (6mm) below where you want the base of your tree to be. For taller trees, leave more space for the tree trunk below the greenery to make it easier to hold them in a base. Use sharp scissors to trim the chenille fibers away from the 'trunk' section of your tree, trimming flush to the wire evenly around the 'trunk' section. With your chenille bump cut to your chosen tree shape, insert the tree into a scrap of dry floral arrangement foam or styrofoam to hold it, and apply glue to the tree fibers. I used a clear paper glue with a small applicator nozzle, and ran it around the tree like a garland. When I had a small amount of glue in place I left the garland to glitter for the front tree. On the remaining trees I used a stiff brush to brush the glue gently and evenly across the fibers over the entire tree. Once the glue was applied in my chosen pattern, I held the tree (using bent nose tweezers or haemostats) over a creased piece of paper, and shook a heavy coating of glitter over the glued sections of the tree. Excess glitter can be gathered up in the crease and put back into the glitter container. Set the trees aside in a scrap of foam until the glue has dried. If you prefer, you can glue flocking instead of glitter over the trees for a coating of snow, or drybrush white acrylic tube paint (not liquid acrylic) over the fibers to give the effect of snow. Embossing powder can also be glued to the trees for a snow effect. You can add small sequins, beads or beaded trims , knotted embroidery thread, to these tiny trees to decorate them for Christmas. See the information on making miniature Christmas decorations for the printable miniature villages for more decoration techniques and tree types.